A disgusted North End resident files a complaint about the wire-munching rats that have been ceaselessly chomping on his or her engine on Commercial Street: Read more. Is this Boston or am I dreaming?!?! New 2way protected commercial st cycle track is BOMB. 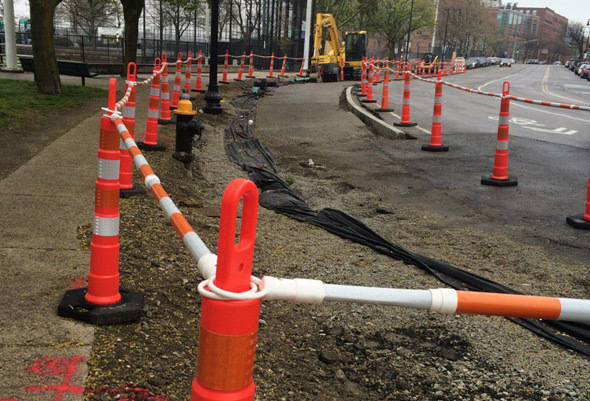 After a pedestrian was run over at the intersection of Lewis and Commercial streets in the North End on May 15, the city banned parking right at the intersection, to improve sight lines for the motorists who are supposed to stop there (but generally don't). Adam Balsam compiled this video report after he filed 311 reports about cars parked in that spot and the city did nothing. There's no sign like an old sign, in this case on Commercial Street near the Greenway in the North End. Of course, it also raises the old question: How many cookies did Andrew eat? Who needs to bother with a sleigh when you've got a bike lane? 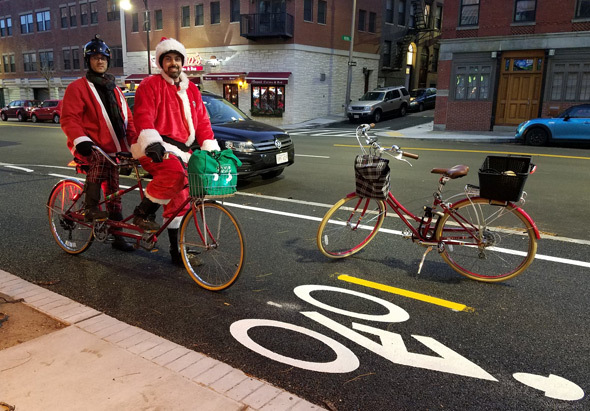 Erica Mattison watched a pair of Santas wheel down the new dedicated bike lane on Commercial Street in the North End this afternoon as part of a Santa ride. Adam Castiglioni checked up on the progress on the Commercial Street cycletrack - a dedicated lane, complete with barriers, for bicycles. Stanley Staco reports it happened around 3 a.m. at Commercial and Charter streets. A third person was taken to the hospital in bad shape. WCVB reports a BMW convertible rolled over. Read more. NorthEndWaterfront.com reports on a skunk that waddled along both sides of Commercial Street by the bocce courts this morning. An overnight water-main break means Commercial Street is shut between Charter and Battery streets, CommuterBoston reports. Tipsy crane. Photo by Thomas Ozbolt. Firefighters responded to 559 Commercial St., where a crane fell over around 11:30 a.m., spilling an estimated 200 gallons of diesel fuel and hydraulic fluid and putting a major dent in a pickup truck across the street. The Boston Fire Department reports the driver and a passerby were transported to Mass. General for evaluation. A BFD hazmat crew is on scene. Fire officials say Commercial Street could be shut for most of the day as the mess is cleaned up. Were do you draw the line. do we allow vehicles to park on hydrants because there's no fire. vehicle illegally parked. UPDATE: Pfaltzgraff will be a landlubber for at least the next three weeks - Boston Municipal Court Judge Thomas Horgan imposed $5,000 bail and ordered a three-week evaluation at Bridgewater State Hospital, the DA's office says. This comes following an 18-month term in a county jail for a similar incident in 2010. The most disgusting public toilet in Boston? 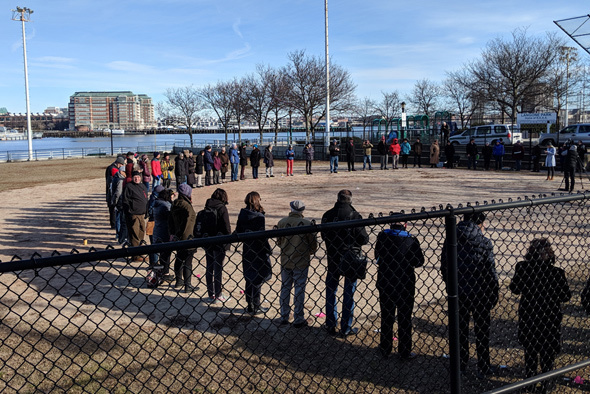 NorthEndWaterfront.com makes the case for the pay toilet at the Commercial Street bocce courts (with photo to bolster the claim). Should be a fun time on Commercial Street, especially if they're met by these guys.